Boon Snack Ball – Simple, but elegant, our kids fight over these little balls filled with goldfish or other snacks. I don’t put them in their lunches though, for fear of losing them in the crowd. 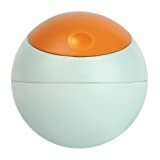 The ball breaks in half for easy cleaning, but the orange (or pink) top also swivels open for easy open closed for snacks. $6 from Amazon and BabiesRUs.